This work was made as a result of a six-week residency at Westonbirt Arboretum and was a comment on the commodification of woodland. The residency culminated in an exhibition and for this I installed two plain wooden chairs sanded back to the bare wood, one of which had an added genus tag. The tag was identical to the tags on trees in the arboretum except for the text which read: 02/1704: SEDES SEDES, taxa domestica, “common chair”. 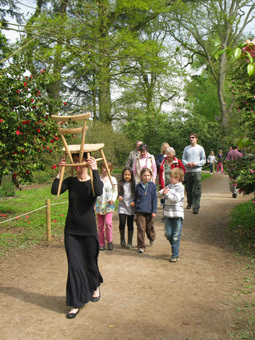 In addition, I carried one of these chairs out of the exhibition hall, across the grassland and into a wooded glade where I placed it amongst growing trees, standing by its side for a few minutes before leaving it within the glade. This performative gesture was intended to further underline the commodification of woodland.